The Second Sky is based on metal. Although the Sky isn't metal, the inhabitant is. She's a 50ft tall spider who creates a delicate web of wishes. 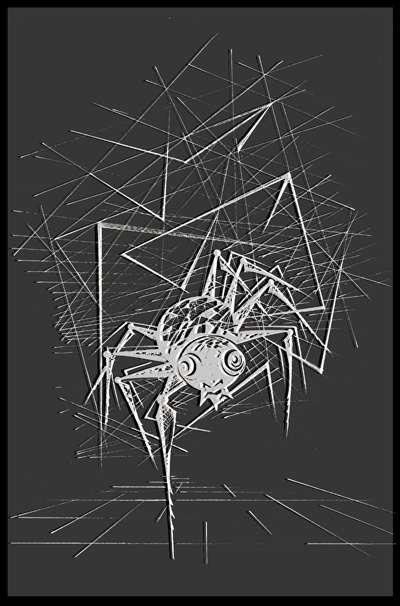 The contrast of a large creature made of metal and rivots gracefully moving along delicate strands of web conjured an image of space and quiet that I couldn't pass up. In Chinese Taoist thought, Metal attributes are considered to be firmness, rigidity, persistence, strength and determination. A creature of Metal is controlling, ambitious, forceful and set in their ways as metal is very strong; and they are self-reliant and prefer to handle their problems alone. However the metal creature can also appreciate luxury and enjoy the good things in life. The Wish Weaver has strong impulses and generative powers and can bring about changes and transformations for those who come into contact with her. Metal has always been one of my favorite materials. It can be bent and shaped for function and beauty. A master at this is sculptor Brad Oldham. Wow, the life he could bring to the Wish Weaver gives me goose bumps. Read about the First Sky and how the Skies were created.